Our vision for Caherconnell Archaeology Field School is to provide unforgettable archaeological experiences within the unique Burren region. In partnership with the National University of Ireland in Galway, we aim to provide the very best archaeological education as well as a cultural element, which sees students interact with the local people daily. Why Choose Caherconnell Archaeology Field School? Excavate Monday to Friday, and explore and learn at the weekend. You will be excavating a 10th-century AD royal settlement. The quantity and quality of the artefacts being uncovered is impressive. This site is of huge significance to Irish archaeology, the first of its kind to be excavated. Explore material culture, history, economic, political and social structure. Understand and work with our high standards of excavation. The skills you learn here can be used anywhere in the world. To ensure the best training and experience possible, we limit our group sizes to 20. Experience all of this in the safe, controlled environment. Take in the stunning Irish landscape of The Burren and the Wild Atlantic Way. Everything is taken care of – we organise accommodation, meals, daily transport, weekend learning, on-site lectures and daily tuition. Come along and join the team! Delight at all of the archaeological intrigues at Caherconnell, Ireland. The site is also home to three stone cahers (ring forts), a probable Late Bronze Age burial mound, an ancient field system, two Bronze Age boulder burials, ancient dwelling sites and a prehistoric house. Your time here will see you work with some of Ireland’s best archaeologists during the day and some of Ireland’s finest conversationalists at night! The Caherconnell Archaeology field school experience is one which will not be soon forgotten and will allow students to experience the very best of Irish archaeology and culture all at once. 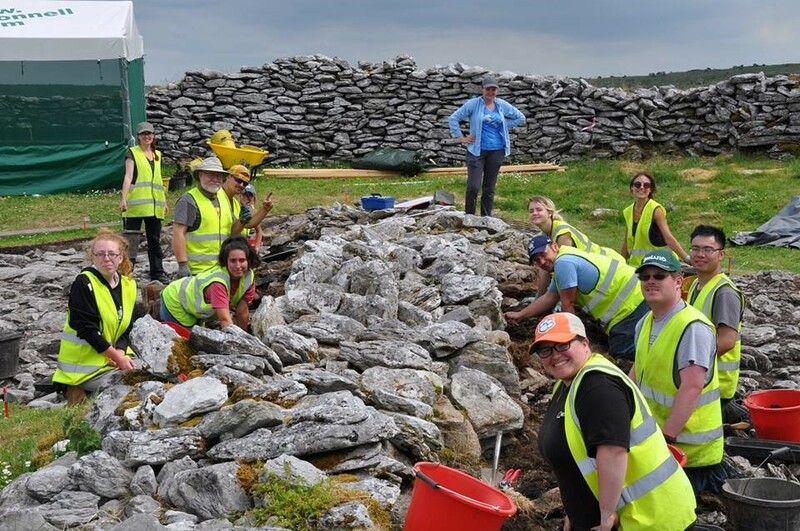 If you want to learn the skills of archaeological fieldwork in a fun yet professional manner – where academic credit is available –Caherconnell Archaeology Field School is the only place for you. Accommodation for the Archaeology Field School is provided by the White Family at The Imperial Hotel, Lisdoonvarna. The Imperial Hotel is located in the heart of Lisdoonvarna in North Clare, Ireland’s historic Spa town, world famous for its music and the home of the annual matchmaking festival every September. The hotel offers a unique blend of friendly service and warm hospitality. The bright and airy reception area is an ideal place to relax, along with two cosy lounge areas. Students can enjoy a full Irish or Continental breakfast each morning before travelling to Caherconnell and a 3-course evening meal when they return to the Imperial every evening. Breakfast and evening meal are covered by your fees. This intensive module is designed to provide students with their first taste of archaeological excavation. It will explain the varied methods used by archaeologists to excavate different types of site, whilst providing practical experience of at least one of those methods in the field.